“Power concedes nothing without a demand…..The limits of tyrants are prescribed by the endurance of those whom they suppress.” Fredrick Douglass, quoted on Miners’ Memorial Day programme. My home in Victoria is not far from a massive heap of dark stone known as Craigdarroch Castle . Now a museum, tourists flock to this imposing monument to one man’s greed and power (and the toil and talent of many). The gloomy castle was the home of the Robert Dunsmuir family, a wealthy dynasty built on the back of coal miners of Vancouver Island , as surely as if each block of granite was hauled up the hill on the bent back of a miner. Coal mines on Vancouver Island flourished from the late 19th century until about forty years ago, providing domestic fuel and power for steam ships. Cumberland , near Courtenay, is one of the communities where the coal mines and, indeed the whole place, were the personal fiefdom of Dunsmuir. Twenty five million tons of high grade coal was produced in eighty years from the dangerous mines that claimed over 300 lives in the years of operation. Cumberland also has a special place in Canadian labour history; it was there that the anti-war union organizer, Albert ‘Ginger” Goodwin, was hunted down and killed by the Dominion Police in 1918. Goodwin was born in England in 1887. He immigrated to Nova Scotia to work in the coal mines. Later he moved on to work in mines in the Crowsnest Pass where he lost his job because of his union activism. He then came to Cumberland to work. By 1916 he was in Trail where he was secretary of the Socialist Party of Canada and active in the Federation of Labour and the local miners’ union. 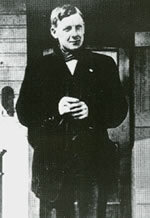 He was well known to the company management as an organizer of a strike for an eight hour work day. Goodwin was examined and classified unfit for military service. He was already outspoken in his opposition to war; he said that he did not believe workers should kill each other for the benefit of the ruling class. In 1918 he was called for re-examination and declared fit to fight. Historians claim that the giant mining company, Cominco, was behind this effort to get Ginger out of the leadership of labour struggles. After his appeals were denied he went into hiding in the mountains near Cumberland with other war resisters. He was tracked and shot by a special constable on July 27, 1918 ; his companions were not touched. Ginger, the leader and organizer, was the prize. The funeral procession on August 2, 1918 down Dunsmuir Avenue was over a mile long; the same day saw BC’s first general strike in Vancouver . The Miners’ Memorial Day (an event that originated in Sudbury , Ontario ), has three purposes in Cumberland . 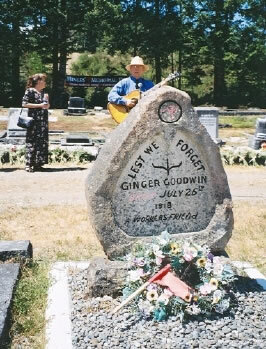 It commemorates the life and work of Ginger Goodwin; it commemorates all the miners who worked and lost their lives in the mines of Cumberland and workplaces throughout BC. It is also a time to renew our commitment to safe and healthy workplaces for all workers. The next day the memorial moved to the municipal cemetery. Chair Mike Keelan of CUPW, standing by the gravestone of Ginger Goodwin (erected years after his death; it has the wrong death date on it.) said that it was enough that Goodwin was a great labour leader that the establishment would have him killed but that his anti-war conviction was the most threatening political position we can adopt – a thought for today’s activists. Special guests at this year’s ceremony were relatives of Goodwin from England . Speaking at the grave his niece, Hetty Launchbury, said her family was proud of their Uncle Albert who dedicated his life to making a better world for all and provides an example to today’s young people. Wreathes were laid on Goodwin’s grave by workers, including two elderly coal miners, and union representatives. “Many men and women stand behind Ginger Goodwin, his contemporaries and present day grassroots activists; he calls us back to the work of solidarity”, Keelan says and “Goodwin is an icon for the possibility of change”. Carlos Flores of CUPE and a Latin American solidarity activist said that Ginger Goodwin is with us today; he is “presente” everywhere from Chile to the maquiladoras of El Salvador to Cumberland . In the Latin American tradition fallen companeras stay in our hearts, always present to support us in our struggles. We gave tribute to all those who toiled underground in the gassy, dusty mines as we moved from Goodwin’s grave to wander the grassy meadow of tombstones and seek out sticks on the unmarked graves of unknown miners. Linda Hargreaves recalled the hardship of miners’ family. The school was near the pit head and when the alarm went off, children who had a father on shift, wondered if they had just lost him. Grieving widows had to send young sons down into the mine after their fathers were killed; there was no other means to support a family, certainly no pensions or social welfare in those days. Laura Stannard of Vancouver ’s Solidarity Notes Labour Choir passed out roses so we could all find an unknown miner’s grave to honour. Racism flourished then as now. 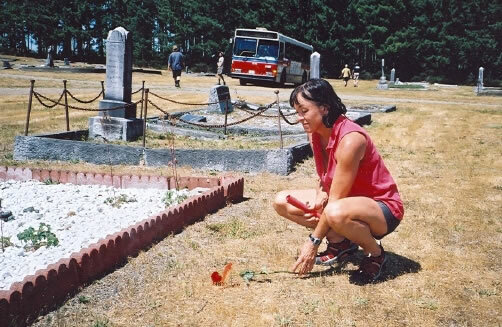 We moved to the separate Japanese cemetery where the graves were desecrated during World War II and Japanese-Canadians were moved from coastal communities to the interior, losing their jobs and property. 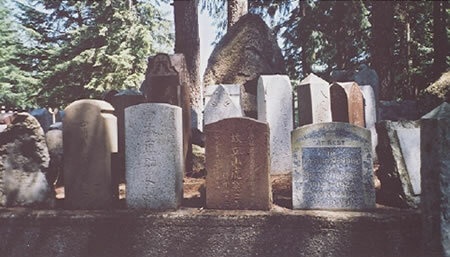 The graveyard was restored in 1957 and gravestones now stand in a shady circle; we left roses in memory of those who suffer both injustice and racism. In the Chinese cemetery we remembered the many workers who came from China to do the backbreaking work of developing Canada . A mine pay sign from the early days says: white men, $2.50/day; Chinese, $1.00/day. That ballroom in Craigdarroch Castle had to be built somehow. In his opening speech Mike Keelan said that people of colour who also laboured at Cumberland were buried in unmarked graves outside the other cemeteries, their pay scale is unrecorded. In 1989 Ginger Goodwin Mountain was officially named. When the NDP government finished the mid-island highway the stretch from Cumberland to Courtenay was named and signed “ Ginger Goodwin Way .” In the election of 2001 the local Liberal MLA vowed he would have the name removed if the Liberals won – which they did. Labour and community activists tried to get the Cumberland council to appeal the decision, but the mayor said there was no time for such matters. Father and young son, Gord and Rory Carter, sang their original song, “The day they shot Ginger down” outside council chambers while the appeal was dismissed. The struggle continues. The 20 th Annual Miners’ Memorial Day in Cumberland will be in June next year. Everyone is welcome and many gather at the lovely campground (reserve early) on Comox Lake in the shade of Ginger Goodwin Mountain . If you are looking for history, solidarity, community and entertainment in a beautiful setting, this is the place to be.